James A. Fisher is an attorney, shareholder, and President of the Firm. Jim was born in 1942 in Pittsburgh, Pennsylvania. He graduated from the University of Michigan in 1964, and received his law degree from Wayne State University in 1968. 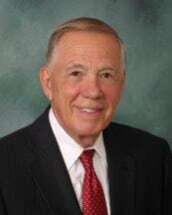 He joined the Firm in 1968 and was an Assistant Prosecuting Attorney for Calhoun County in 1969 and 1970. Jim's practice is primarily in civil litigation, in state and federal courts, in matters involving municipal and school law, employment law, personal injury and family law. He enjoys a reputation as one of southwest Michigan's finest family law attorneys. His practice further includes estate and business planning. Jim is a member of the American Bar Association, State Bar of Michigan and Calhoun County Bar Association, of which he is a past President. He is a member of the Calhoun County Estate Planners Council and the Friend of the Court/Family Law Committee. Jim is also a Life Fellow of the Michigan State Bar Foundation. Jim is active in the community. He is a past Chairman of the Board of the Battle Creek Area Chamber of Commerce and also a past President of the Rotary Club of Battle Creek. In addition, he is a Paul Harris Fellow. He has served on a variety of community organizations and has been a board member and legal counsel for various nonprofit corporations.